The value of memorizing multiplication tables, the proper spelling of words, the location of countries on a map, et cetera, is being questioned by many people these days (mostly low-achieving dummkopfs) based on an easy access to data on the Internet and other media. All such people need to do is get fairly close to spelling topics of interest correctly and other people who do not subscribe to the aforementioned philosophy have seen to it that the laziness and ignorance of those who do subscribe are duly accommodated. I'm referring to basic life skills of course, not nuclear science or phenology. The obvious advantage gained in memorization is developing an intuitive feel for what the entire realm of subject entails. Strong visual clues during the learning process augment retention of data. For instance, electronic calculators in their various forms are great for arriving at precise numerical answers with given input conditions. Enter an exact set of numbers and get an exact result on the display (right or wrong, depending on the input data and the correctness of the algorithm). Whether or not the answer makes sense and should be believed depends on the user's familiarity with expected results. That is where being exposed to charts, tables, nomographs, and graphs of functions and related items is of inestimable value both to the learning process and to the application process later in real-world situations. On many occasions I have posted articles from publications that predate the handheld calculator and personal computer era which include those kinds of learning aids for readers. Here is another. As Albert Einstein famously said*, "Any fool can know. The point is to understand." Any problem involving proportion can be solved graphically without much difficulty. Such problems occur often in a serviceman's and experimenter's life; therefore, the chart, presented this month should prove applicable in many cases. 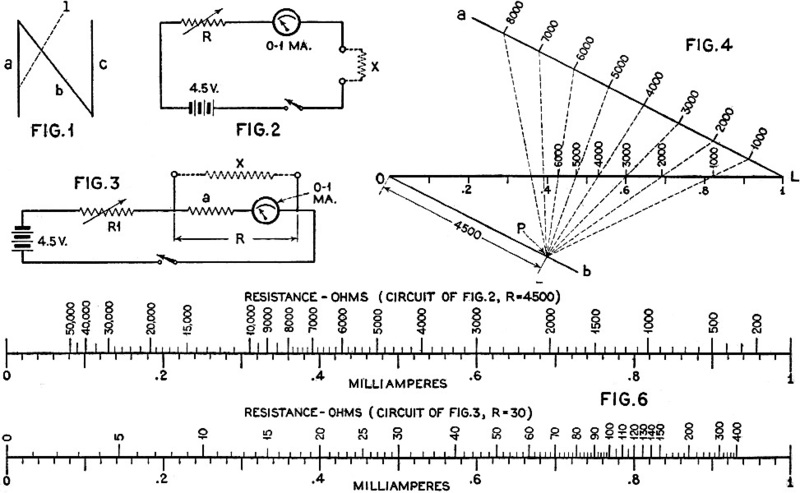 For instance, one can use any milliammeter as an ohmmeter but then it takes a little arithmetic to find the resistance after readings are taken. This arithmetic will be eliminated when using the chart in Figure 5. 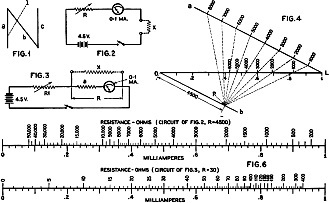 The chart can also be applied to the slide-wire bridge, a construction is given for an ohmmeter scale employing a milliammeter in the two popular circuits. 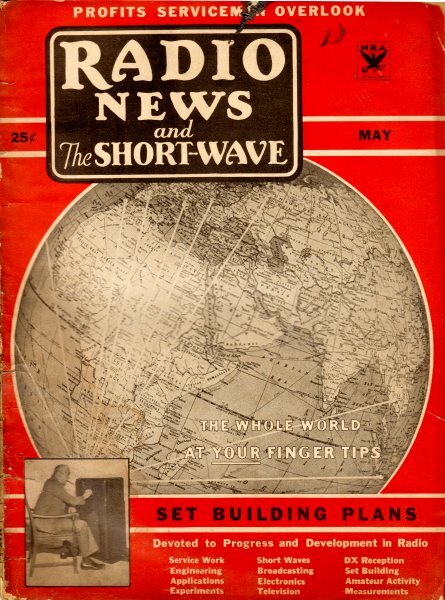 In the February 1932 issue of Radio News, the formulas for the different kinds of charts were derived and here the N-chart was introduced. It consists of three linear scales in the form of an N or a Z and is useful in several kinds of proportion-problems and some forms of multiplication. 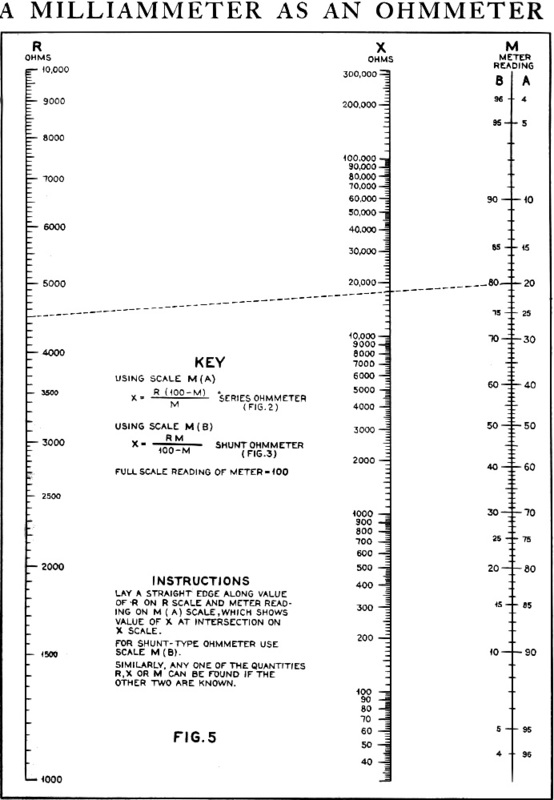 As seen in Figure 1, the chart has the drawback that it is hard to utilize the extreme end of the diagonal scale since the line, 1, does not intersect scale c within the limits of the paper. In some cases, it will be found that nearly one fifth of the scale b on each end cannot be used. Therefore. instead of using the N chart, a logarithmic arrangement was used in Figure 5, even though this meant the calculation of a special scale. It solves the same formula as the N chart. Referring to the chart of Figure 5, connect the meter reading on scale M (A) with the value of R on scale R and the intersection on scale X shows the value of the unknown resistance. For instance. if, as in our case, R is 4500 ohms and the meter went down to .2 ma. with the resistance X inserted, then the sample line shows that the resistance of X is 18000 ohms. All you have to know is the value of R. This is the resistance which will let just enough current flow to make the meter show full-scale reading. It can be figured out with Ohm's law. With a 1-ma. meter and a 4.5-volt battery, R is 4500 ohms. With a 10-ma. meter and a 4.5-volt battery it would be 450 ohms and with a 1-ma meter and a 1.5-volt battery it would be 1500 ohms, etc. The range of such an ohmmeter is from 1/10 R to 10 R. It is possible to obtain some kind of reading above and below this, but they are not accurate. A scale can be constructed for a given ohmmeter rather easily. This is illustrated in Figure 4. Line L represents the scale on the meter. The same divisions and numbers should be put on it. Then, in order to get the ohmmeter divisions, draw two lines, a and b, through the ends of the scale at any convenient angle as shown, a and b are parallel. On a, regular divisions are set off representing ohms, on any convenient scale. Next you should find a point P on scale B so that OP equals R when measured in the unit employed on a. Then draw lines from P to the divisions on a. The intersections give the divisions for the ohmmeter scale on L. This construction is good for the series ohmmeter (Figure 2) only. For the shunt type, the divisions of a should be put on b instead and the point P should be taken on a in the same manner as before. It will be found difficult to get to both ends of the scale with just one position of P. After some divisions have been made with P in one position, the point can be shifted, which means that you are using another measuring unit on both line a and b. It will be found that the scales obtained by this method, for the ohmmeter of Figure 2, resemble those for Figure 3 if R is the same; only, they are mirror views of each other. When another range is required, it can be done by making R twice as large (or 10 times as large) and then multiplying the readings of your previous scale. 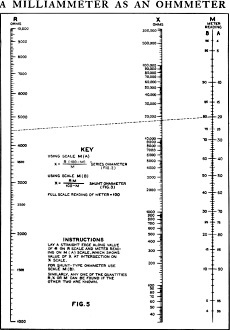 In Figure 6, two examples of completed scales are given. One is for a 0-1-ma. meter in the series circuit with a resistance of R equals 4500 ohms. Its range can be extended by employing a resistance of 45000 ohms and a 45-volt battery. Then the scale readings should be multiplied by 10. The other scale is designed for an ohmmeter of the shunt type, employing an 0-1-ma. meter with an internal resistance of 30 ohms. If your meter is somewhat less than 30 ohms you should connect some resistance in series with it so as to make the total 30 ohms. Shunting the meter with a 3.3-ohm resistor will make the scale lower, multiply all values with.1. When your meter has a resistance of 50 ohms (such as the universal meter) all scale values should be multiplied by 5/3 or 1.67. * Albert Einstein also supposedly said, "I never commit to memory anything that can easily be looked up in a book;" however, its veracity is in question.